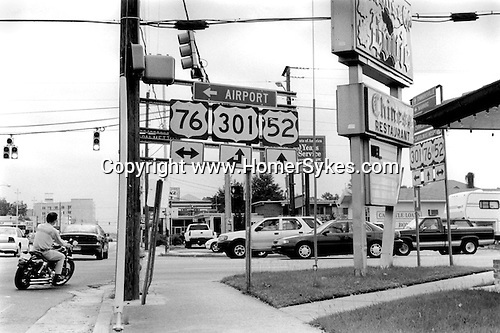 JACKSONVILLE NORTH CAROLINA - USA JUNE 1999. A TYPICALLY BUSY DOWN TOWN INTERSECTION WITH MOTOR BIKE RIDER TURNING RIGHT AND NOT WEARING A CRASH HELMET. NUMERIOUS CARS AND STREET SIGNS.